Aimed at key decision makers and those responsible for global strategy, this book is about changing markets and the complexity of undertaking business in a fast paced technological and knowledge based age in a dynamic and strategic context. Trends show a renaissance in entrepreneurial activity that is fuelling innovation particularly in the so called BRIC nations of Brazil, Russia, China and India. For example, both China and India have benefited immensely from Foreign Direct Investment (FDI) and as a direct consequence both nation states are reshaping the way global business is conducted and the way investment decisions are made. Evidence would suggest that Europe and the United States are more dependent on the BRIC trading nations for earnings and profits. Geographical distance is no longer a barrier between nations; however, the challenges of ethnic diversity in domestic markets are multiplied by the difficulties of delivering goods and services into global markets with different cultures and languages. 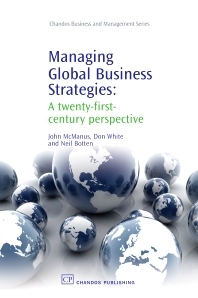 This book examines the issues associated with undertaking global business in complex and knowledge related markets. The rapid change in international and global business; The market and competitive forces that shape international and global business; The socio-cultural forces that shape international and global business; The forces that shape strategic effectiveness in global markets; Emergent global and international business strategies; Managing the strategic process in a global and international business environment; Case study: China, India and Russia – a strategic and market perspective within the global software industry; Case study: Evaluating the commercial aerospace industry of the BRIC nations; Conclusion. John McManus, PhD is based at the University of Lincoln (UK). Prior to becoming an academic, Dr McManus worked within the global software industry. Dr Don White is Dean of Faculty Business and Law, University of Lincoln. Dr White has lectured extensively, on management information systems and has acted as a consultant to the National Health Service (HNS). Neil Botten is Principal Lecturer, Strategic Management at Westminster Business School. He is the author/co-author of several highly successful textbooks.